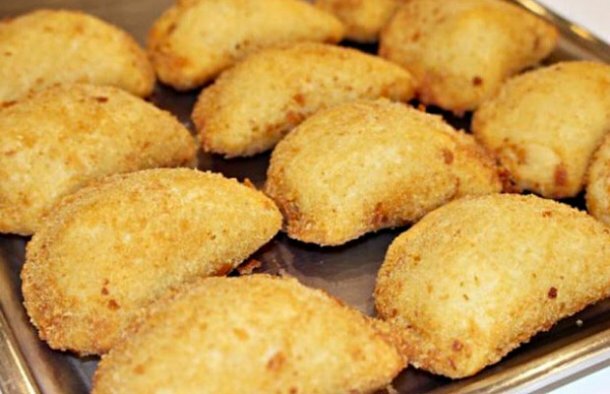 These delicious Portuguese cheese, ham and olive patties (rissois de queijo e fiambre) make the perfect snack. Heat a pan with the water, margarine and some salt (to taste). When it boils, add the flour, stir with a wooden spoon and cook for about 3 minutes stirring constantly until you can form it into a ball. Remove and put the dough on a kitchen board, let it cool slightly and knead very well, until the dough has good texture. Let it cool completely (kneading occasionally so that it does not crust on cooling). Extend the dough as thin as possible with the help of a kitchen roll (do not spread the dough on a surface with flour as this makes the dough thick and dry), if you have any difficulty in extending it, lightly grease the worktop with a little oil. Cut the cheese into small cubes, chop the ham and the olives with a knife. Spread the dough, put a generous serving of cheese, ham and olives and fold the dough to cover the stuffing well. Cut the patties with a pasta cutter or anything of choice. Brush the patties with the beaten egg and crumble breadcrumbs on them. 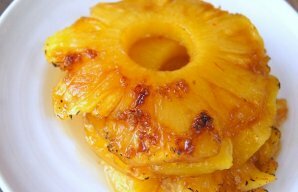 This Azorean caramelized pineapple recipe (receita de ananas caramelizado) is very popular in the Azores islands. 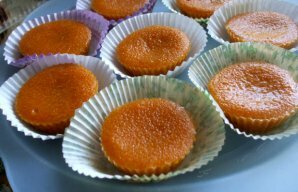 These Portuguese carrot tarts are perfect for a snack, on the run or a lunch-box treat, enjoy. 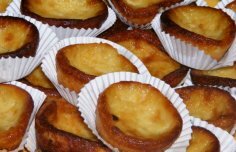 How to make Portuguese milk tarts.